Brows can be a sensitive subject. We’ve all fallen victim to a case (or two) of over-tweezing, and maybe have even experienced a bad wax. And once you’ve messed up your brows- it seems like forever before they return back to normal!! That’s why we were oh-so-happy to see that bold brows are back more than ever. Gone are the days of too-thin, and instead we welcome our natural shape! Of course, a natural-shaped brow could still use a little grooming. We love these Anastasia tweezers to catch pesky strays, and this razor set is perfect for keeping everything trimmed. However- if you do decide to trim your brows, be super careful! One wrong swoop and you could end up with a totally different look than you bargained for. If you don’t trust your trimming skills, we suggest a brow seal. This will keep unruly hairs in place all day long and create a totally polished look. 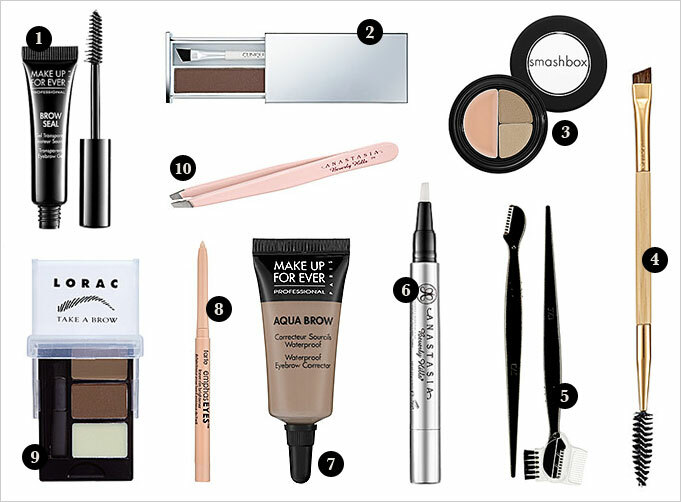 If you’re lacking in the brow department, there are a plethora of products to help you out! Whether it is a serum to encourage hair growth (like this one from Anastasia) or a highlighter to fake an arch- you need not worry if your eyebrows are looking sparse and unshapely. Our personal favorite “fake it” trick just so happens to be the easiest- filling in our brows! Using a brow brush and a lightweight powder, make tiny strokes to fill in your brows where needed. Don’t go overboard- you don’t want to create an entirely new shape. You’re only enhancing what you’ve already got! Some gals swear by pencils over powders- but we’ve found a brow pencil can create too harsh of lines. By using the brush + powder, your brows will look completely natural. If you tend to touch your face a lot or are worried about the powder rubbing off, you can try a gel instead- it has heavier pigment and will last even after a night of dancing. When your brows are at their (natural) best, the need for other makeup can fade away. Use these tips to create your low maintenance beauty routine for spring. We’d love to know- which product are you most excited to try? Love it! I use the Smashbox Brow Tech from Sephora (your #3) and it works wonders.